If you wish to upload your images to your RedCart FTP server as a one time operation (“upload and forget about them”) then you should export your images. Once the images have been exported there is no further connection between Lightroom and the exported images - your originals remain safe within Lightroom of course. For Lightroom 2 users this is the only way to use this plugin - Publish services aren't available. Go to the Library mode, select the images that you wish to send and then press the Export button. LR/RedCart needs to know to which FTP server your images should be uploaded. This may be either RedCart's hosted server or your own, depending on the type of license that you've taken. 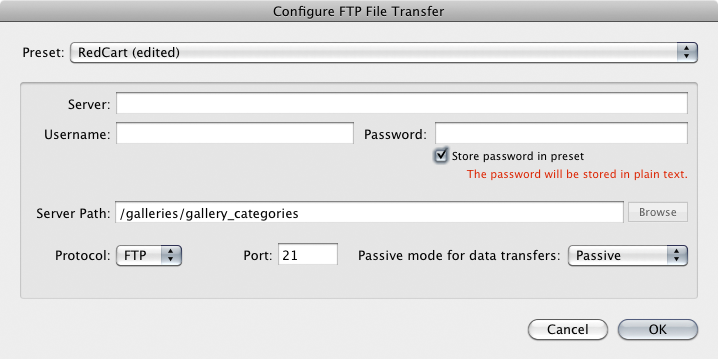 Click on the FTP server settings menu and choose Edit... The following window opens to allow you to define your connection. Note that the path that you enter here must point to the directory called "gallery_categories". 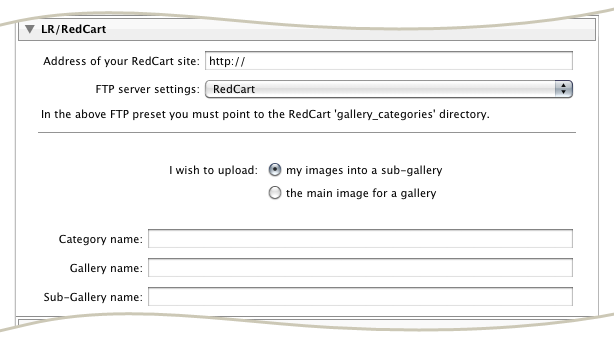 You must also specfiy the Category, Gallery and Sub-Gallery names and tell LR/RedCart if you're uploading a Sub-Gallery or a Main Image for the entire gallery. You should also browse the remaining standard export panels to define how your images will be exported from Lightroom before they are uploaded to the server. Note that there are no settings to adjust the image sizes since the plugin automatically restricts the image size based on RedCart's specifications. Once you're ready press Export and your images will be uploaded to your server. The thumbnails will also be created and exported to the right place.